Taormina, facing the Ionian sea and near to both Messina and Catania, is an incredibly beautiful Sicilian town. It occupies an ancient settlement on a hill, approximately 250 meters above the sea. In this very point, according to historians, an ancient citadel stood. Today, visitors can, in fact, still see the remains of this glorious past. Fragments of ancient walls and mansions, but also rests of sepulchers, refined and colorful pavements, water reservoirs still conjure up the greatness of the first civilizations that enriched this land. A Saracen castle still stands out in the blue Sicilian sky. Taormina is also known and cherished for its Medieval Palazzo Corvaja, dating from the 10th century, featuring an exceptional Moorish Gothic style and crenellated walls; a beautiful fountain built in 1635 in a Baroque style; the lavish municipal gardens, full of what, in the past, were called “Victorian follies” and countless rare plants. Castles, gardens but also religious places. 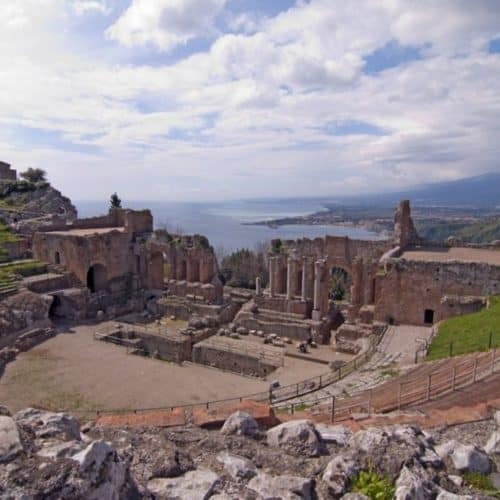 Taormina is, in fact, also well known worldwide for its beautiful ancient churches, such as the Anglican Church of Saint George, built for all the foreign tourists visiting Taormina (ex. : Oscar Wilde, D.H. Lawrence, Bertrand Russell, Tennessee William…..), and above all for the English families who decided to settle on the island, choosing it to become their adopted homeland. Today, like in the past, Taormina is a place where culture thrives. The very symbol of this sparkling artistic life is the ancient theatre of the town where concerts are recurrently organized. The view is breathtaking and the acoustic perfect. Mostly built of brick, this Roman theatre has probably been rebuilt upon the foundations of a theatre erected by Greek settlers. Sicily’s second largest theatre of its kind (after the one in Syracuse), it is regularly used also for opera and theatrical performances. The audience leave the theatre, after a concert or a play, in a state of awestruck delight, due to the unique setting and to the magical atmosphere that inhabits it. You can hire in Taormina the best cars: a sport car, a SUV, a super car, a convertible car or a prestige car. Our fleet include latest sports car and supercars (exotic car), like Ferrari 812 Superfast or Lamborghini Aventador roadster.